Everyday fishing, my Mercury Verado, and my Lund Boat. Before my guide season began in mid-May I had full intensions of adding to “Fish Good” every day. As it turns out, however, my everyday guiding load saps me by the end of the day and I just don’t have the energy to write well, much less write coherently. I did, however, want to give a mid-season report on my Mercury Verado and Lund. They are a fantastic package. One of the super advantages to my 200 Verado tiller is that it is equipped with power steering or hydraulic assisted steering. There is no trolling situation that I can’t achieve a preferred speed. It’s common to have my engine trimmed up to minimize propeller to water contact (which slows me down), and let the tiller go to assist my guide guests with tangles, netting fish, removing fish, etc and keep to boat tracking and trolling the entire time so my guests can keep fishing. Everyday, I unload the boat and let it idol at the launch dock. My fishermen always comment on how quiet and smooth an engine it is. The engine, coupled with the Lund 2010 Pro-Guide are a fisherman’s perfect fishing platform. It’s 100% pure fishing efficiency and it works! I have the best office in the world. Is this a plug? Yup. If you’re in the market, get in touch with your local Mercury and Lund dealer and seriously consider this package. You WILL catch more fish, and you will have more friends that will want to fish with you. Yesterday afternoon I fished a party of 5 (not including myself) on Ottertail Lake, MN in a 30 mph wind. We fished rough water, and we were very successful (walleye fishing). There is no other boat make or model and tiller package that can fish they way this boat does. None. How is the season progressing so far? Very well. The walleye fishing’s been very fine–lots of very nice walleye. This morning I did a small mouth trip and boated at least 40 fish most of which were in the 17-19 inch class–very exceptional small mouth fishing. Most of the fish I’m seeing now are weed-orientated, and it doesn’t matter whether they are deep or shallow–weeds are a need. Sandy flats and rocky bottoms are nice to fish over but the fish just haven’t been there. Keep your eyes and boat over deep and shallow weed edges. Fish hard. Fish smart. Fish Good. Check out the beautiful weeds. A ton of my guests believe they see fish when I go over weeds like these. Images of weeds get tricky, especially when the tops of the weeds appear separate of the base of the plant, which look like fish suspending above the grass. I apologize for the messy graph screen. Graphs are notorious for being water spotted and stained. 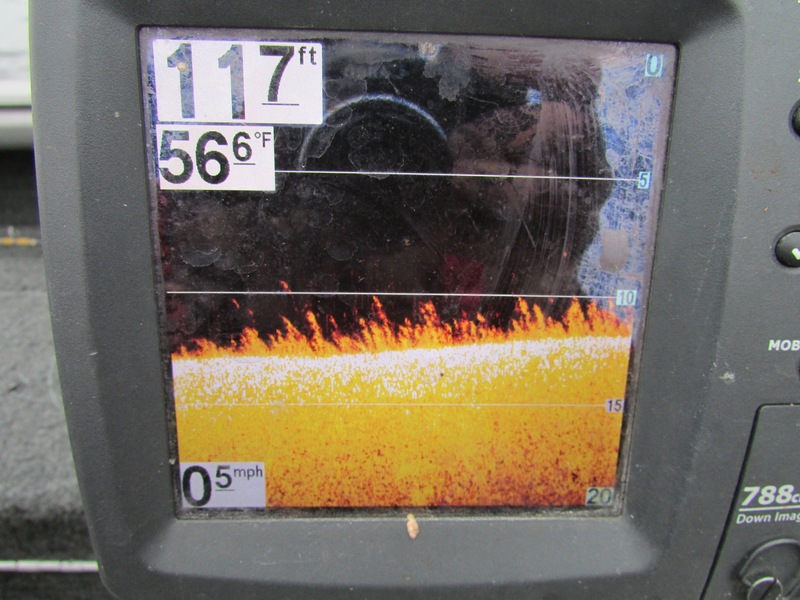 Every time I net a walleye and bring it over my graph it gets spotty and hard to see. To keep a clean screen, have a squirt bottle filled with vinegar on stand-bye–and a nice soft cotton rag. I clean my screen a couple times a day. The resolution is much better then trying to see through the haze of water spots. Good luck on the water and be careful of those “tricky” weeds–interpretation is key. Try not to want to see fish too bad. My guests are often looking at my graph and telling me they see fish, when in fact, there isn’t a fish on the screen. Fish Good.